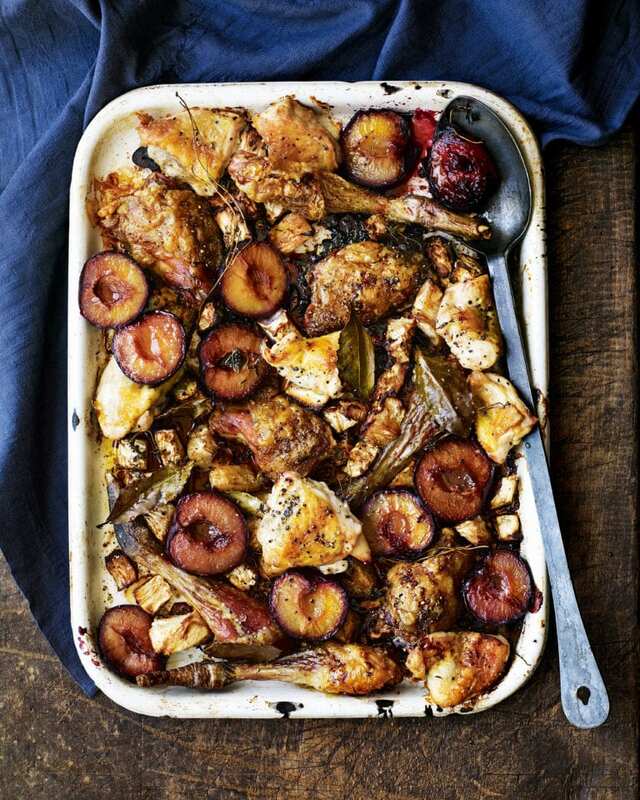 In this tray bake recipe, Gill Meller roasts guinea fowl with celeriac and plums and seasons with thyme and garlic. Simple to put together – it’s perfect for a lazy supper. Heat the oven to 200°C/180°C fan/gas 6. Put the drumsticks and thighs in a large roasting tin (reserve the breasts to add later). Drizzle with oil and season with salt and pepper, then roast for 30 minutes. Meanwhile, peel and cube the celeriac into chunky bite-size pieces. When the guinea fowl has had its initial 30 minutes cooking time, scatter in the celeriac along with the thyme sprigs, bay leaves and garlic. Dot with the butter and return the tin to the oven. Turn down the oven to 180°C/160°C fan/gas 4 and roast for 1 hour, turning halfway. Remove the tin from the oven and turn everything once more. The meat should be quite tender. Add the halved guinea fowl breasts to the tin along with the plums/damsons. Drizzle with the honey and return to the oven for 20 minutes until the breast meat is just cooked through. Rest for 6-8 minutes before serving. Ask your butcher to joint the guinea fowl into 8 pieces or search ‘how to joint a chicken’ for a step-by-step guide on how to do it yourself. Save the carcasses to make stock, if you like.